Moving on from the 1960s, here’s my choices for runners-up to the best superhero openings of the 1970s. The 70s’ best openings were the Christopher Reeve Superman movie and the Wonder Woman TV show. As you’ll see, there’s fewer choices for the 70s versus the 60s. Various changes in late 1960s children’s programming led to the decade’s superhero shows dying off by the early 70s. The most prominent being the backlash against violence in children’s programming, which the superhero shows bore the biggest brunt for criticism. Real-life events (the Vietnam War, the assassinations of Martin Luther King and Robert F. Kennedy, etc.) also likely fueled part of the anti-violence backlash. “Hong Kong Phooey” is a 1974 Hanna-Barbera created superhero parody, cashing in on the martial arts craze of the time. 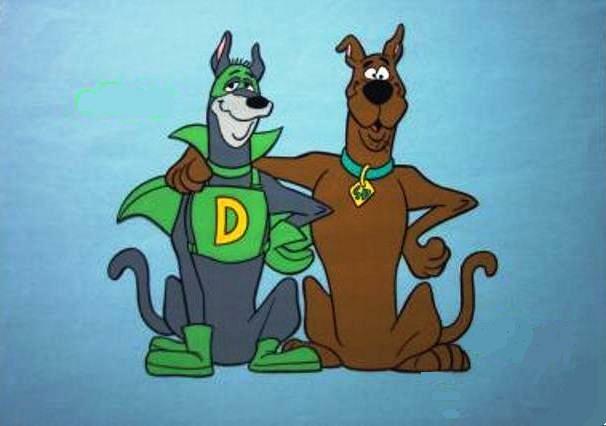 Phooey was a bumbling martial artist superhero, who (like Inspector Gadget in the 80s) usually relied on the secret help of his sidekick, a cat named Spot, to save the day. In his secret identity, Phooey was Penry, the janitor for a big city’s police station. African-American actor Scatman Crothers voiced Penry. He also sang the show’s memorable theme song. The entire series is available on DVD. Probably the most popular live-action Marvel superhero series to date is this take on the Incredible Hulk. Bill Bixby played Bruce Banner, while Lou Ferrigno played his Not-so-Jolly Green Giant self. In this series, Bruce was renamed “David Banner,” for reasons known only to Hollywood. Interestingly, the closing credits and its melancholy piano theme (named “The Lonely Man”) are probably more famous than the opening credits. The live-action Filmation-produced series based on the popular Golden Age superhero, then newly acquired by DC Comics. DC reflected the show’s changes in the comics themselves for awhile. Sterling Morris (owner of WHIZ radio/television and Billy Batson’s boss) sent Billy and a newly-mustached Uncle Dudley on an extended road trip to shoot footage for the station. The entire series is available on DVD through the Warner Archive. Isis was a companion superhero series to “Shazam!,” and gained her own comic for a time. A version of her has recently returned to DC’s pages. Plastic Man gained his own Saturday morning series in 1979. Unlike the comic version, however, this one swapped his sidekick Woozy Winks for two sidekicks. One was a native Hawaiian bizarrely named “Hula Hula,” who spoke/behaved like comedian Lou Costello and had a bad luck streak. The other new character was Penny, a blonde woman who liked Plas. Plas eventually returned the affections in the second season, as the two got married. They had a son named “Baby Plas,” with similar powers as his father. Several other segments aired with the show originally. It debuted on ABC in the fall of 1979 as a two-hour anthology series, later reduced to 90 minutes by the following spring. Backup segments included “Mighty Man and Yukk” (a superhero and his extremely ugly dog), “Rickety Rocket” (a Speed Buggy knockoff set in the future with some African-American teens solving mysteries), and “Fangface“‘s second season. The Plastic Man portion of the show’s available on DVD. See my previous post on Cavey and the Teen Angels here, as well as Teen Angel Dee Dee Sykes. The entire show’s available on DVD. Finally, the Super Friends, probably the most famous superhero cartoon to come out of this era. Since it’s had various incarnations, I thought I’d link to this YouTube video including all of the show’s openings. Note toward the end, the final few openings seem quite different from the earlier versions. For one, the heroes are actually allowed to punch stuff, per the 80s being somewhat more accepting of TV violence than the 70s. My favorite opening’s “Challenge of the Super Friends.” Even “South Park” seems to agree, as they’ve referenced the Legion of Doom in one episode (Hall of Doom included). As far as I can tell, the entire series has been released by now to DVD. Cartoons at the box office: "Frozen" gets promoted over "The Nut Job"
Package show: "The Scooby-Doo/Dynomutt Hour"